A stunning debut novel with an intriguing literary hook: written in part as a letter from a victim to her abductor. Sensitive, sharp, captivating! Gemma, 16, is on layover at Bangkok Airport, en route with her parents to a vacation in Vietnam. She steps away for just a second, to get a cup of coffee. Ty–rugged, tan, too old, oddly familiar–pays for Gemma’s drink. And drugs it. They talk. Their hands touch. And before Gemma knows what’s happening, Ty takes her. Steals her away. The unknowing object of a long obsession, Gemma has been kidnapped by her stalker and brought to the desolate Australian Outback. STOLEN is her gripping story of survival, of how she has to come to terms with her living nightmare–or die trying to fight it.A stunning debut novel with an intriguing literary hook: written in part as a letter from a victim to her abductor. Sensitive, sharp, captivating! Gemma, 16, is on layover at Bangkok Airport, en route with her parents to a vacation in Vietnam. She steps away for just a second, to get a cup of coffee. Ty–rugged, tan, too old, oddly familiar–pays for Gemma’s drink. And drugs it. They talk. Their hands touch. And before Gemma knows what’s happening, Ty takes her. Steals her away. The unknowing object of a long obsession, Gemma has been kidnapped by her stalker and brought to the desolate Australian Outback. STOLEN is her gripping story of survival, of how she has to come to terms with her living nightmare–or die trying to fight it. 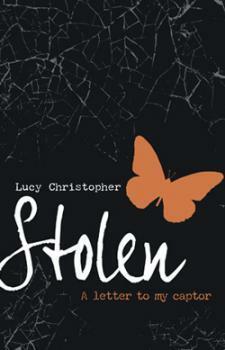 Lucy Christopher, author of Stolen and Flyaway, was born in Wales but grew up in Australia, living in Melbourne from the age of nine until she completed her undergraduate degree at Melbourne University. After various attempts at being an actor, a coffee maker, a waitress and a nature guide, she moved back to the UK to earn a distinction in a Creative Writing MA from Bath Spa University. Lucy took on part-time work as a university lecturer at Bath Spa University, teaching on the undergraduate and the MA creative writing courses, and is currently undertaking a PhD to explore the ways that Australian literature represents wild places, particularly in its writing for young adults. Lucy’s debut novel, Stolen, was written as part of this PhD. Hmmm, an interesting concept. Nice review Carrie.